Kiyokazu (Kinya Kitaoji) retires from the company where he worked for many years. He will begin a new job as a temp at a game center affiliated with his former company. After finishing his last day of work, he goes home. To celebrate his 60th birthday, his wife Yoshie (Yoshiko Nakada), son Kenji (Masahiro Komoto), daughter-in-law Takako (Naomi Nishida) and grandson Yuki (Takuro Ohno) are there waiting for him. Something causes Kiyokazu to become angry and he leaves home. Kiyokazu heads to bar. At the bar, Kiyokazu and his two childhood friends, Shigeo (Shigeru Izumiya) and Norio (Kotaro Shiga), drink and talk about old times. Their conversation drifts to the state of their neighborhood and, in particular, rising crime. The three men decide to form a night patrol of the neighborhood. On the first night of their neighborhood patrol, Kiyokazu and Norio helps a woman from a purse snatcher. Their story is featured on the evening news and they become encouraged of their new endeavor. 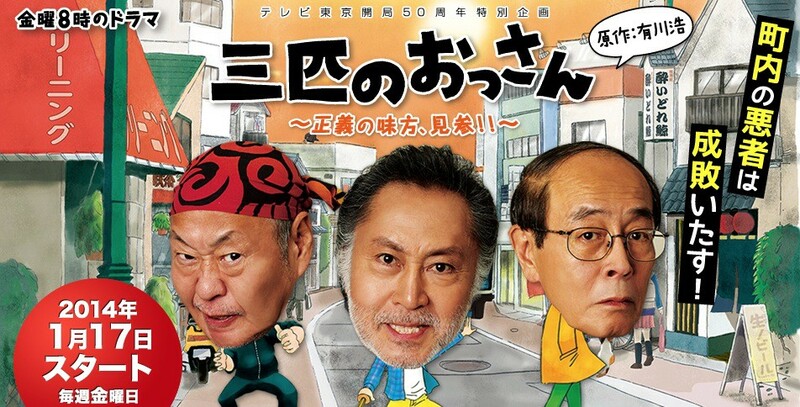 Based on novel "Sanbiki no Ossan" by Hiro Arikawa (published March, 2009 by Bungeishunju Ltd.).